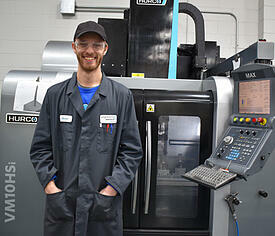 Hobbies: Aaron's interest in the tool making trade actually began when he was a child. He spent his time mentally designing new inventions and crafts to make out of wood. His fascination with constructing things by hand followed him into adulthood. In his free time, he still enjoys woodworking as well as outdoor activities such as camping, hiking, biking and fly fishing. Favorite Thing About The ERC: "I enjoy the hands on aspect of this work. It makes me feel like I did something at the end of the day. Also, people are a lot happier here so I actually enjoy coming to work!"